Paris Saint-Germain coach Thomas Tuchel said that superstar Neymar will start Tuesday’s crucial Champions League Group C clash away at Red Star Belgrade if he comes through Monday’s final training session at Rajko Mitic stadium unscathed. 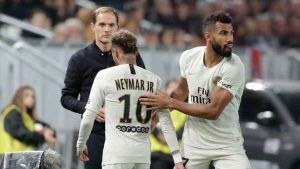 Speaking on the eve of the clash at a press conference, Tuchel confirmed his intentions to utilise Neymar if his fitness is established ahead of the game. “I can say that Neymar will train with us,” said the German tactician. “After that session, we will decide. I think he will come through it fine. Assuming that he does, he will clearly play. Tuchel added that he has not yet decided between goalkeepers Gianluigi Buffon and Alphonse Areola between the sticks, but vowed to send his team out to attack in front of what promises to be a hostile home crowd. “I have to speak with the goalkeepers first,” said the former Borussia Dortmund and Mainz 05 boss. “A decision will be made after training. “We will attack, that much is clear. We will look to dominate possession too, that is also obvious. However, possession on its own is worthless. It is important to be aggressive in possession and to create scoring chances.